Where is The Quarters Downtown? This 40-hectare (100 acre) area extends from 97 Street to 92 Street, and from 103A Avenue to the top of the North Saskatchewan River Valley. Over the next 20 years, The Quarters Downtown will be transformed into a vibrant, diverse, and inclusive community, taking advantage of its connectivity to the central business district, cultural districts, and river valley. This City-led redevelopment began with a community visioning process in 2006. The vision for The Quarters Downtown is that of a healthy and dynamic community that respects the unique character of existing neighbourhoods while welcoming new residents and new spaces. The area currently houses about 2,400 residents; however, at full development, The Quarters Downtown is expected to accommodate between 18,000 to 20,0000 residents. The area is planned around sustainable community design principles. A mix of land uses and development forms, appealing design, and green spaces are proposed to create a unique experience for residents and visitors. The redevelopment of The Quarters Downtown is guided by the following Council-approved documents. These documents provide the vision for the neighbourhood, the zoning in place, and information about the Community Revitalization Levy, which outlines the public infrastructure program necessary to encourage private sector investment. The Quarters Downtown Area Redevelopment Plan (ARP) provides the Council-approved vision, principles, and policies to guide the redevelopment and revitalization of The Quarters Downtown. The Quarters Downtown Urban Design Plan provides direction on the built form, including building massing and height, as well as streetscaping, pedestrian walkways, architectural focus points, parks and open spaces, and neighbourhood amenity spaces. Adopting The Quarters Downtown Area Redevelopment Plan required several amendments to the Boyle Street/McCauley Area Redevelopment Plan (Bylaw 14982). Bylaw 15039 was adopted on April 15, 2009. This Bylaw amended the Zoning Bylaw 12800 to rezone the majority of the properties within The Quarters Downtown plan boundary to (DC1) Direct Development Control Provision. The development regulations guiding development of The Quarters Downtown are available in the City's listing of Direct Control Provision (DC1) areas, listed under The Quarters. Five distinct districts or precincts make up The Quarters Downtown. There are 4 “quarters” each with a unique character and design. At the centre of the four quarters is the pedestrian-focused main street known as The Armature. The Armature is a contemporary, pedestrian-focused green street around which the four quarters radiate. The Armature is planned to include mid-rise, mixed use developments enriched by the public art and planting details along the periphery. This quarter is an extension of the downtown and the arts district. It provides a high quality public realm that will accommodate civic and provincial institutions along with medium- and high-density residential development. This quarter is named as it was the location of Edmonton’s original downtown. The importance of preserving buildings with historic significance is recognized. New development in this quarter will enrich the experience of the area and complement the historic surroundings. This quarter is a continuation of the residential neighbourhood to the north. It will contain lower density housing forms that are compatible with the residential character of the surrounding neighbourhoods. This quarter is named after the five corner intersection at 95 Street and Jasper Avenue. This quarter provides the greatest densities and building heights of all of the quarters. The Quarters Overlay (Section 860 of the Zoning Bylaw) applies to all of the land zoned (DC1) Direct Development Control Provision within The Quarters Overlay boundary area. The Overlay provides regulations to achieve the objectives of The Quarters Downtown Area Redevelopment Plan and Urban Design Plan. The Quarters Downtown Community Revitalization Levy (CRL) was approved by the Province and came into effect on January 1, 2012. The Government of Alberta introduced Community Revitalization Levies as a way to help municipalities stimulate growth in underdeveloped areas of their communities. 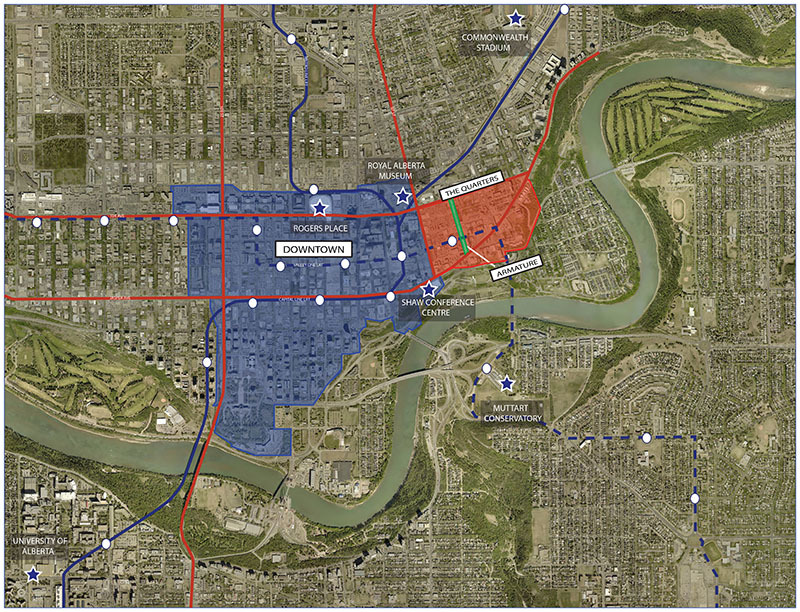 Through The Quarters Downtown CRL, the City of Edmonton is able to dedicate future property tax revenue to fund public projects, such as infrastructure upgrades or roadway improvements, designed to encourage private sector investment in The Quarters Downtown. The resulting new development will generate an increase in tax revenue for the area. The CRL is not intended to change the total amount of taxes collected in the area – the tax rates will be the same as for the rest of the City and will, as always, be based on the assessed market value of the property. In this way, the general property taxes in the rest of the city do not pay for the new public facility or infrastructure (The Quarters Downtown Community Revitalization Levy Bylaw).